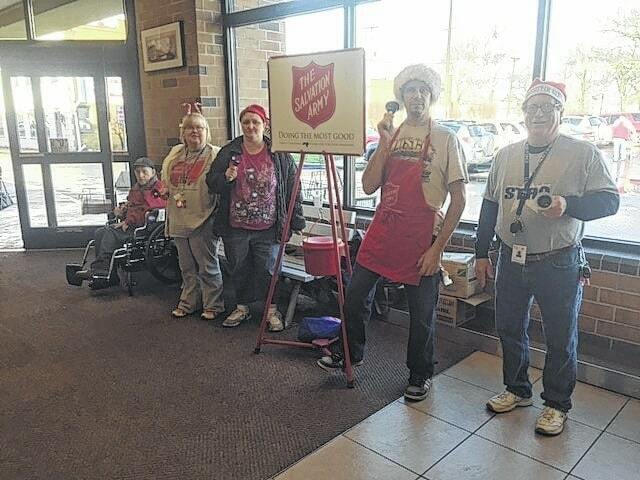 Submitted Photo The !mpact/Aktion Club rings the bells and mans the red kettles at the entrance and exit of the Portsmouth Kroger from 10 a.m. to 2 p.m. through Christmas Eve as part of the Red Kettle campaign. Thus far, the group has raised $10,454 in donations for the local Salvation Army since Nov. 18. “Merry Christmas!” the team calls to everyone who walks by. The customers, some carts full and some empty, offer smiles, kind words, and often donations. The team is volunteering for the Salvation Army’s annual red kettle campaign. The Salvation Army’s red kettle campaign is a staple of the holiday season, and locally that means a lot of fun hours of volunteering for the !mpact/Aktion team. The team volunteers at various sites and with many local organizations throughout the year, including the Salvation Army’s daily lunch program, but the red kettle campaign is the biggest fundraising event the !mpact/Aktion crew undertakes. As of Wednesday, the team had gathered $10,454 in donations by offering smiles, holiday wishes, and ringing the bells at the Portsmouth Kroger. This year, two crews from the club have manned the kettles and bells at the store at both the entrance and exit – and customers seem to love them, said Aktion Club Advisor KC Chatfield. The !mpact/Aktion Club will be at the Portsmouth Kroger from 10 a.m. to 2 p.m. through Christmas Eve.